Crest Events organise and manage a range of corporate events. If you are a business owner or manager we know how busy and stressed working on the day to day running of the business and working towards your next deadline can be. Crest Events provide fully managed event solutions for businesses like yours. Outsourcing your event management needs to Crest Events will save you time, money and a great deal of stress. We have spent years sourcing and vetting our suppliers guaranteeing the best possible service for the best possible price. An office launch is the perfect opportunity to show off your new property to prospective clients, old clients and even your suppliers or sponsors. That goes for new businesses too; it’s a great way for networking and to get the ball rolling on your new venture. We can organise everything from the catering and entertainment to your giveaways pens, pads and mementos. There is plenty of behind the scenes needing organised from having a theme, dressing your venue and waiting staff to serve you, Crest Events has it all covered. 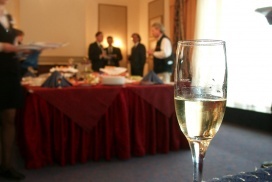 One of our most requested services is our champagne reception. Our event managers will go over what is needed and then you can leave the rest to us. Our team of friendly waiting staff will set everything up ready for you and your guests arriving. We have a variety of available sparkling wines, champagne, drinks and flavourful mocktails for non-drinkers. We have canapés and other tasty delights just let us know what you want or have a look at our sample menus for ideas. We also provide entertainment and other services if you need. 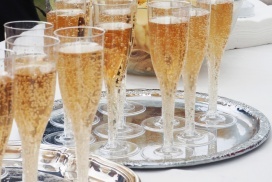 If you need more than a champagne reception we also offer popup bar services. Lastly, we clean up and pack everything away leaving the place spotless. Stress-free and simple. 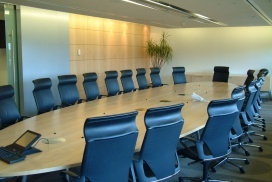 Crest Events can plan and manage a range of services for your boardroom entertainment. Nothing else can impress your clients like a light business lunch, fancy finger food and classy sandwiches to a full 3 course meal. The light lunch is a favourite of our clients for boardroom meetings and corporate entertaining. If your business meeting is not taking place at your own offices Crest Events will find a venue that is suitable for the size of your party and in keeping with your budget. We are happy to help answer any and all questions about our corporate services.